Georges Abdallah, the Arab communist struggler for Palestine who has imprisoned in French jails for over 34 years, announced on Thursday, 11 April that he is launching a three-day hunger strike in solidarity with the Palestinian prisoners’ hunger strike inside Israeli jails, the Battle of Dignity 2. He is joined on the strike by 20 of his fellow prisoners, including 12 Basque political prisoners standing actively in solidarity with the Palestinian prisoners’ strike. This is not the first time that Georges Abdallah has participated from afar in the collective hunger strikes of the Palestinian prisoners; he also joined in the strikes of 2014 and 2017 from Lannemezan prison, where he is held. He also refused meals for three days in 2016 in solidarity with the hunger strike of Palestinian prisoner Bilal Kayed, fighting against his imprisonment without charge or trial under administrative detention. Palestinian prisoners launched the Battle of Dignity (Karameh) 2 on Monday, 8 April in response to escalated repression inside the Israeli prisons directed by the minister of internal security Gilad Erdan (also directing international attacks against BDS organizing and Palestine solidarity and working to suppress freedom of expression around the world in his role as the Israeli Minister of Strategic Affairs.) Their demands include the installation of public telephones for the prisoners, removal of cell-phone “jammer” devices, an end to sanctions and collective punishment imposed on the prisoners, restoration of family visits to all prisoners, access to appropriate medical care and treatment and ending isolation and solitary confinement. “The Palestinian prisoners invite other political prisoners around the world to join in this battle of dignity, not only in solidarity with the Palestinian struggle but to raise their own issues and demands for justice, dignity and freedom. The prisoners have expressed their solidarity with the political prisoners held all over the world, including those who are fighting now in jails in the Philippines, Turkey, Morocco, Greece, the United States and elsewhere,” Barakat continued. 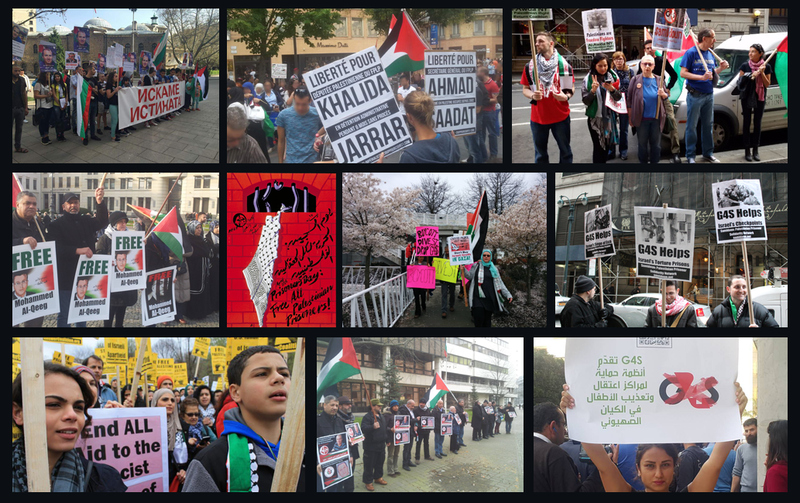 “The Palestinian prisoners’ movement is on the front lines confronting Zionism, imperialism and reactionary regimes, and the political prisoners of the world are also on the front lines of this collective, international struggle. Georges Abdallah’s entrance into the hunger strike alongside that of his comrades inside French prison underlines the fact that there is an international dimension to the Palestinian prisoners’ movement that is united in struggling towards victory,” he said. “Every time the Israeli occupation attempts to confiscate the rights that have been obtained by the Palestinian prisoners’ movement through blood, sweat and sacrifice, they will face a movement that is determined to fight back with unbreakable will and strength. Georges Abdallah and his comrades are an integral part of that movement and of the victory that will be achieved through this collective struggle,” Barakat concluded.